Car attack in Jerusalem: Why are terrorists ramming vehicles into crowds of people? 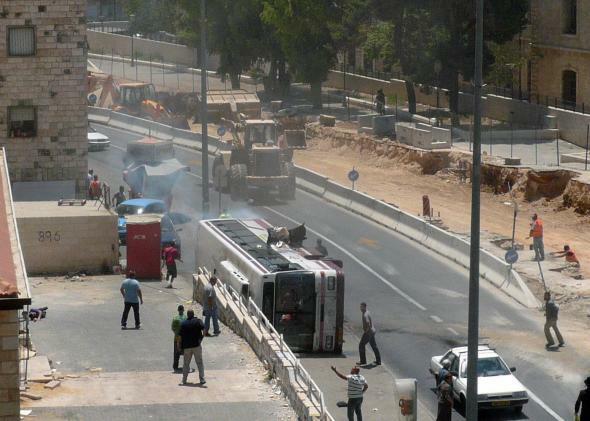 Bystanders watch a Palestinian man drive a bulldozer along Jaffa Road in Jerusalem after ramming and overturning a bus on July 2, 2008. Earlier today a Palestinian man who Israeli police say had connections to Hamas drove a car into a crowd near a light rail station in Jerusalem, killing one person and injuring a dozen others. It followed a strikingly similar attack in the same area two weeks ago that killed a 3-month-old Israeli. In both cases, the driver was killed by police at the scene. These attacks are the latest manifestations of the current atmosphere of violence and tension in Jerusalem. They are also the latest examples of a terrorist tactic that gets less discussion than many others but seems increasingly common, particularly in Israel. Ramming attacks have been a weapon in the arsenal of Palestinian terrorists for some time now. During last summer’s fighting in Gaza, for instance, a construction excavator was used to attack a bus in Jerusalem, earning the praise of a Hamas spokesman. In 2011, when a stolen taxi rammed into a police roadblock outside a club in Tel Aviv, injuring seven, the Jerusalem Post reported that it was the fifth attack of its kind in the past three years. The worst of these was the 2008 bulldozer attack in Jerusalem that killed three people and injured dozens of others. The article recommends that practitioners take care to gather enough speed to “achieve maximum carnage” once crowds begin to scatter, and to choose their targets carefully. “If you can get through to ‘pedestrian only’ locations that exist in some downtown (city center) areas, that would be fabulous,” the author, editor-in-chief Yahya Ibrahim, writes. He also suggests a number of countries where such an attack could take place, including the U.S., Britain, Canada, Australia, France, Germany, Denmark, and Holland. So far, thankfully, no one seems to have attempted an attack along these lines. Its crude simplicity makes it a tactic more likely to be employed by relatively unskilled “lone wolves” than organized and trained terrorist operatives. But like with many amateur terrorist tactics, the effect is as much psychological as physical. It sends the message that objects we take for granted can be transformed into weapons at the blink of an eye.